Millions of people have been affected by the typhoon which swept through the Philippines with winds gusting up to 270km/h. Parts of the low-lying islands were completely flattened and many hundreds of thousands of people are now homeless. 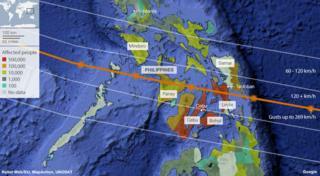 The map below shows the path of the storm through the Philippines. 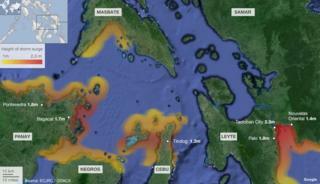 The worst-affected islands include Leyte and Cebu. Relief Web has produced estimates of the numbers of people affected in each province. 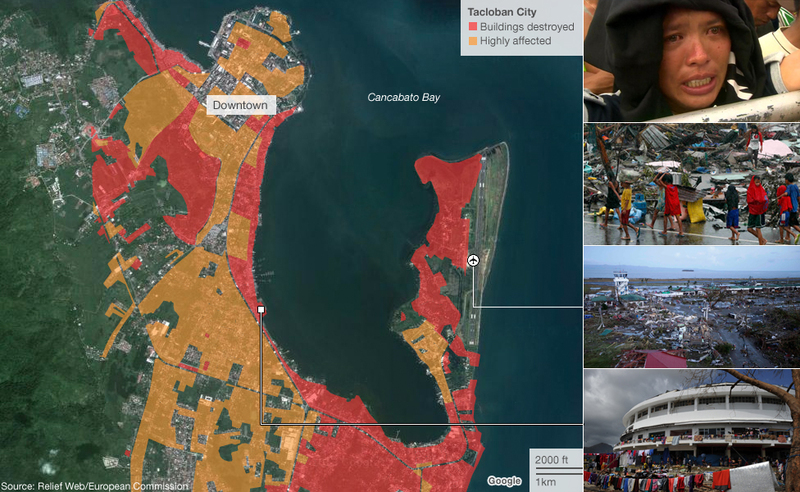 It says Tacloban City in Leyte province has been devastated, with most houses destroyed. In total, 670,000 people are said to have been displaced - about 55% of them are living in evacuation centres. But with roads blocked and poor communications, a complete picture of how many people have been affected may not emerge for some time. The strong winds whipped up by Typhoon Haiyan also contributed to a storm surge, which sent a wall of water crashing through some low-lying areas. The storm surge reached its height at the city of Tacloban. 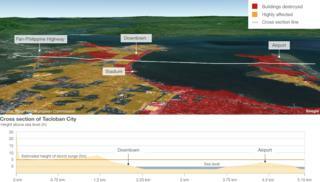 Although official calculations by the Global Disaster Alert and Coordination System (GDACS) put the height of the storm surge in Tacloban at 2.3m, local conditions will have meant the actual level was far higher. The city is located at the head of a bay which faced directly towards the oncoming typhoon and the arrival of the storm surge coincided with a high tide forcing the water levels up to about 5m. 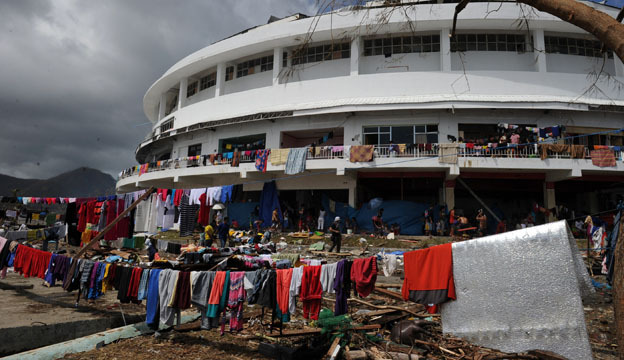 The typhoon and storm surge has destroyed much of Tacloban, flattening buildings and leaving many of the 220,000 population homeless. 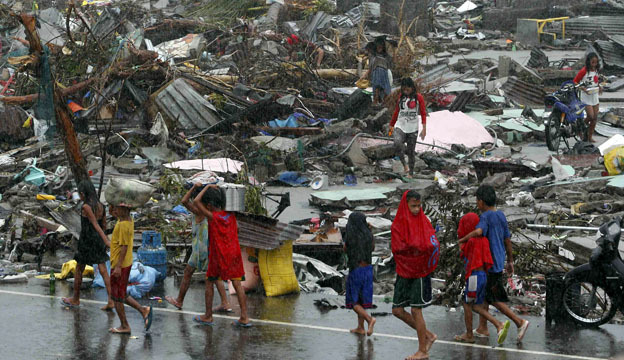 Piles of debris are now hampering relief efforts and people are desperate for food and shelter. The city lies on the easterly island of Leyte and caught the full force of the typhoon with winds approaching 310km/h (195mph). 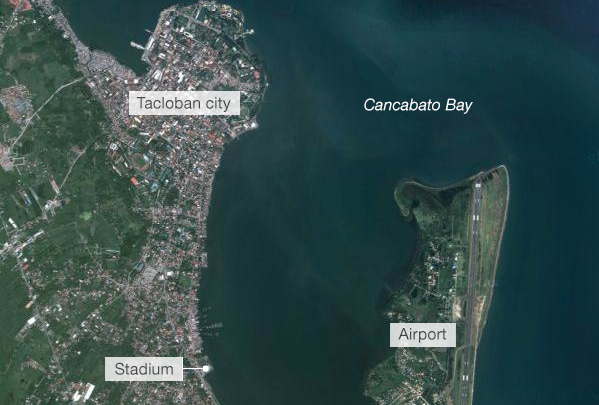 The spit of land on which Tacloban airport is located and the downtown areas are the parts of the city that have been worst-affected. 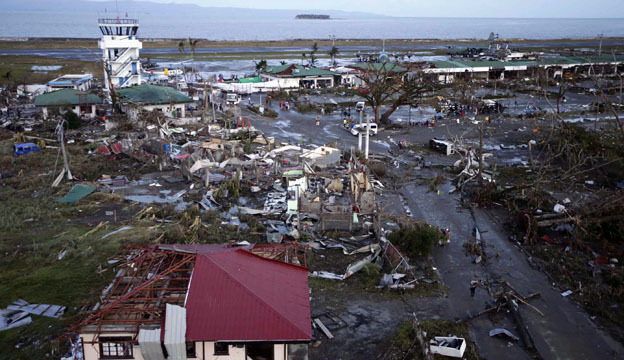 Once the relief effort is completed, rebuilding Tacloban could take many years.